Here’s a quick weeknight dinner recipe with ingredients you probably already have on hand. For a leaner version of a Mexican casserole, I used lean ground turkey (can use beef, chicken or no meat), refried beans (you can use fat free) and light shredded cheese. The leftovers are delicious the next day, just pop it back in the oven for 10 minutes until the cheese is bubbly again. I love casserole dishes because it makes a lot of portions for lunch or dinner the next day and they’re so simple to make. Spray an 8″ square casserole pan with nonstick cooking spray. Set aside. Preheat oven to 375 degrees. In a large skillet, heat olive oil and place over medium high heat. Once hot, add the diced onion and red bell pepper. Sauté until cooked through and add ground turkey. Brown turkey, breaking up the bits and pieces with a rubber spatula. When turkey has browned, add the chili powder, cumin, salt and garlic powder. Mix well. Spread a thin layer of ground turkey at the bottom of your casserole pan. 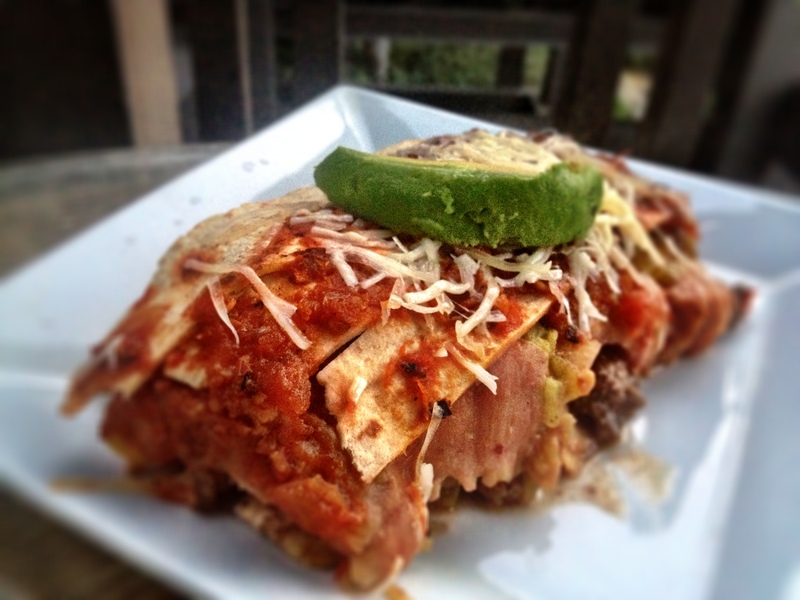 Top with a layer of refried beans, green chilies, a sprinkle of cheese and four of the tortilla strips. Repeat this process until all of the ground turkey has been used. After laying on your last four tortilla strips, spread the salsa over top along with remaining cheese. Place in the oven for 15 minutes. When casserole comes out of the oven, let sit for 20 minutes before slicing. Serve with sliced avocado.